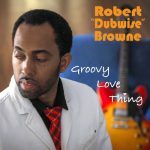 Robert ‘Dubwise’ Browne is undoubtedly one of Jamaica’s most prolific guitarists, whose signature look coupled with a musical style that fuses Jazz with Reggae and Rock has left lasting imprints in studios and on major stages around the world. 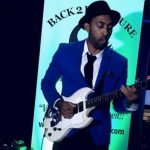 Influenced by Jimmy Hendrix, Lee Ritenour, and Joe Satriani, Dubz, as he is affectionately known, has carefully mastered his craft while working as a studio session musician, Producer, and touring musician and he has no intention of slowing down. An initial encounter with Dubz can only be described as coming face to face with a ‘quiet storm’. He’s very reserved but as soon as he touches the stage he transforms into a confident and commanding star – the music takes him over and all that he feels comes out through his fingers and he’s got your attention locked. A highly sought after axe man, Dubz has performed on every continent with an impressive listing of celebrated artists such as the world famous Jazz pianist Monty Alexander, Damian Jnr Gong Marley and Julian Marley, the sons of the late reggae icon, Bob Marley, Grammy winning artist Shaggy as well as multi platinum selling and Billboard chart topping vocalist Diana King, as well as Joe, Heather Headley, Maxi Priest, Sly & Robbie, Michael Bolton, the Crown Prince of Reggae – Dennis Brown, Burning Spear, as well as Tessanne Chin (season 5 winner of NBC’s The Voice). No stranger to the recording studio his guitar riffs are featured on Ziggy Marley and the Melody Maker’s album “Free Like We Want 2 Be” (1995), multiple Grammy winner and platinum selling vocalist Lauryn Hill’s “Miseducation” album (1998), a number of Shaggy albums including “Lucky Day (2002), Summer in Kingston ( 2011) and Out of Many One Music (2013 ), Diana King’s AgirLnaMeKING album (2010), Joseph Hill (Culture), and Burning Spear. “After working with other artists for most of my career as a musician and experiencing all there is from this perspective, I felt it was time to sing my own song – share what’s inside me through my own music…” says Dubz. 2004 was the first step towards singing his own song when he released his debut solo album – ROBERT DUBWISE: BIRTH on his Dubz House record label. The album featured famed saxophonist Dean Fraser and veteran guitarist Ernest Ranglin. In 2010 he followed up with his sophomore album, ELECTRIFYING GROOVES OF DiVERSION. Both albums are currently available on iTunes and all major online music platforms. This need to “sing his own song” – may also have something to do with the fact that he was born into one of Reggae’s Royal families. He is the son of acclaimed Bassist, Glen Browne of Tarrus Riley’s Black Soil Band. 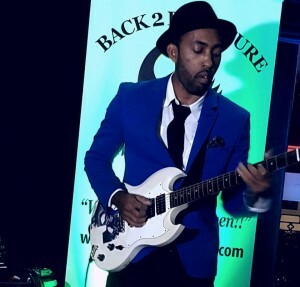 His twin brother, bassist Richard “Shams” Browne has produced some of dancehall’s hottest riddims and is the former manager of the dancehall group, TOK. His uncles – producer Cleveland “Clevie” Browne formerly of The In Crowd was a member of the famed classic dancehall duo Steely and Clevie, Danny Browne formerly of the Bloodfire Posse is the producer and founder of the Mainstreet Crew and label in the mid-90s and uncle Dalton Browne was influential in launching the Big Ship label with reggae icon Freddie McGregor and still plays guitar in his band today. Throughout his career Robert “Dubwise” Browne has travelled and performed all across the world. He performed at the prestigious Blue Note Tokyo (Japan), playing the opening set for Shaggy. He performed twice at the Air Jamaica Jazz and Blues Festival as well as performing at Reggae Sunsplash 2006 in Ocho Rios. Robert has been touring and recorded with NBC’s “The Voice” season 5 winner, Tessanne Chin, Burning Spear, Jimmy Cliff, Toots Hibbert, Ziggy Marley and the Melody Makers, Morgan Heritage, Monty Alexander, Damian “Jr Gong” Marley, Julian Marley, Heather Headley, Beres Hammond, Tarrus Riley, Sly & Robbie and more. In 2015, with the help of Back 2 Da Future Music – Robert completed an extensive UK radio tour for album number 3 – ‘Groovy Love Thang’ undertaking interviews with various BBC, community, internet and urban radio stations in cities such as London, Liverpool, Birmingham, Bristol, Leicester, Northampton, Gloucester, Ipswich and culminating with a live stage appearance at the Leeds Black Music Festival on bank holiday Sunday.